I can hardly believe it, but I think I have a new worst experience at the mall. The mall at Town was pretty bad, but this was worse. Then it was just mild embarrassment in front of my friends and one stranger, while today… today it was public humiliation! Only ten years later, he and his younger brother Winstrom Garlic embarked on a dangerous expedition into a nearby cave, hoping to find treasure. They didn’t, of course, and Winstrom ended up with a bloody nose, but it sure was fun. That day Typhon decided that he must devote his entire life to adventuring! Fast forward to early this morning, over fourteen years later. Typhon Garlic now has a Ph. D. in theoretical physics, and in fact he is writing the very words you are now reading. That’s right, and in case Peter didn’t mention this before posting my journal entry on his blog, I am Dr. Typhon Garlic. My sister Alecia forced me to take her to the mall, supposedly to replace the bags of clothing that got lost when she flew to Egypt. I think she probably just wanted to shop. Anyway, once we entered, we decided to meet back at the mall’s entrance at 2:00PM. Not being one to sit on the bench for five hours, I decided to take a look around the place. 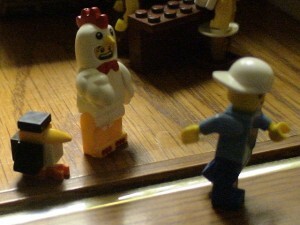 Being waved down by the chicken suit guy. “Really? I am kind of hungry. What sort of food do you sell here?” I asked him. “Oh, we don’t offer food, we just have coffee,” he replied. “Uh, no, we don’t serve any poultry products here, sir.” He was getting annoyed. Wally runs off, leaving Typhon in the suit. “You’re welcome! You won’t regret it, dude!” He started to run off. 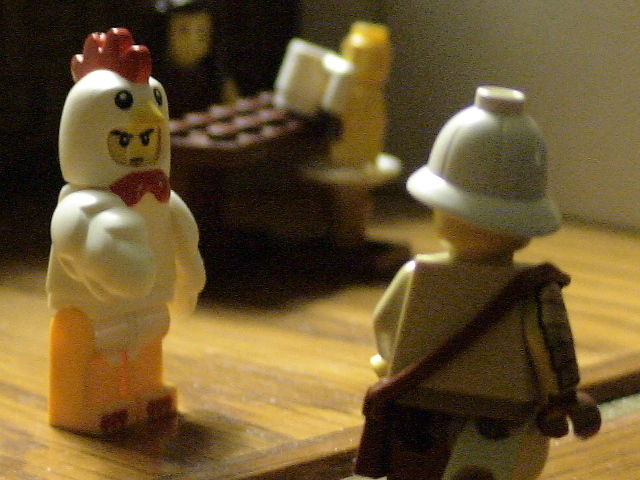 Doomed to wear the chicken suit forever? “What?! I didn’t sign up for this!” I was beginning to panic. “Well, too bad. Unless you find someone else to do your job for you, you’ll be wearing that chicken suit for the rest of your days, kid!” She chained my leg to the cafe’s door. But anyone who passed by either ignored me, or told me to quiet down. 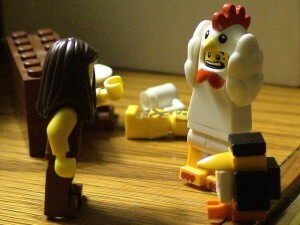 I screamed for about half an hour, but nothing happened, and I resigned myself to being a crazy guy in a chicken suit. However, I suddenly spied two policemen walking up to the store. “Help me, please!” I yelled. But they weren’t there to help me. They were there to shut down Coughy’s Cafe for selling, well, poisonous coffee. I guess there was something harmful in their brew. Anyway, the police were able to take the chain off in time for me to rendezvous with Alecia. She didn’t even suspect anything strange had happened. And that’s it for today! Now I just have to wash the rest of these pesky feathers out of my hair. Any suggestions on how Typhon could best rid himself of those nasty feathers? Leave your comments below, and I’ll see ya next post! Maybe he can get more soap from that giveaway! Just make sure it doesn’t explode. . . .
I’m sorry that I only think of it after I wrote the other comment, but it seems all malls in Aether are strange. One was run by a criminal, the other has people with megaphones, and now one sells poisonous coffee! You know, you might be on to something, buddy! Perhaps someone should do a 1500-word long research paper on the surprising amount of strange malls in the Aether and reasons behind their strangeness.